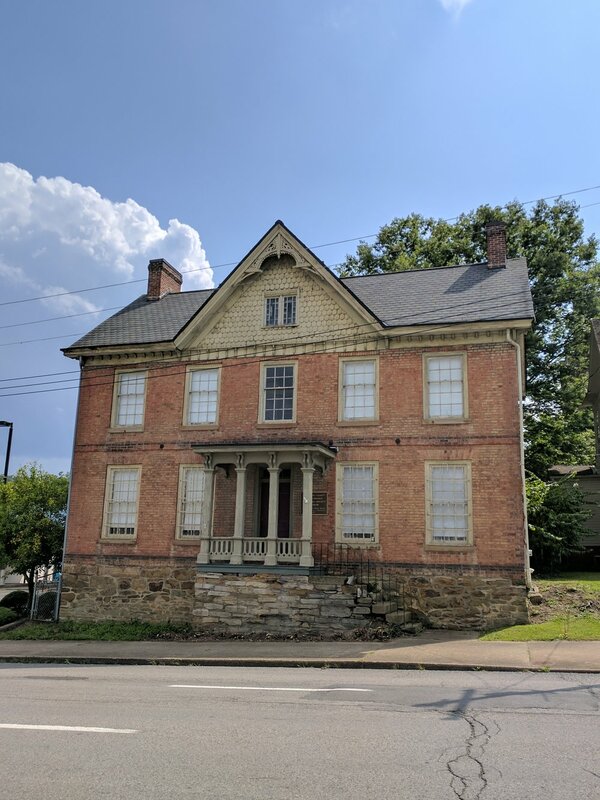 A few weeks ago, Aaron and I hit the road and visited Clarksburg, WV to attend a workshop hosted by the Harrison County West Virginia Historical Society and the Preservation Alliance of West Virginia (PAWV). The fun and engaging workshop was led by Anna Lynn Stasick from the PAWV, and we took away a lot from the experience. 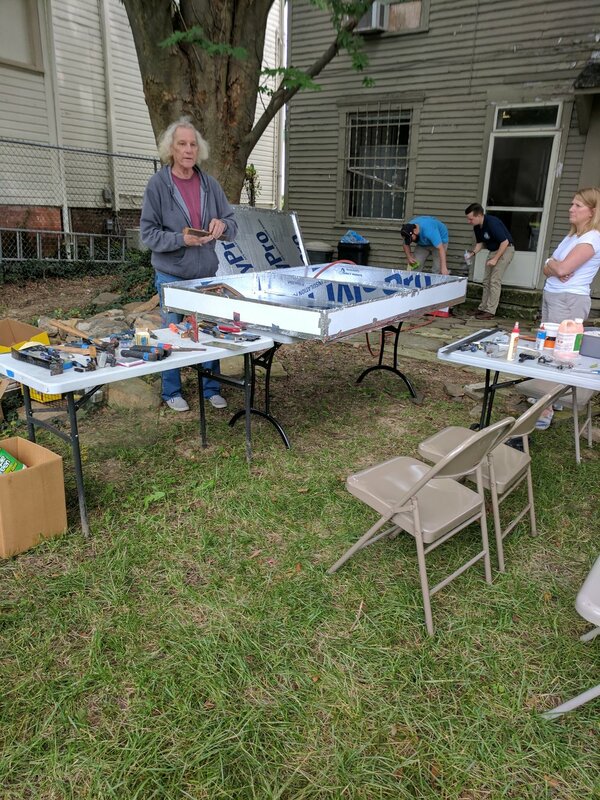 We learned about the proper tools to use, tips for removing disassembling and labeling windows, how to test for lead and safely remove years worth of built-up paint, and how to repair damaged wood and glass that have seen better days. Most importantly we learned to be patient. With any preservation project, it’s a labor of love, and that’s certainly true with windows. 1. Properly label all of your windows prior to disassembling them. In older homes, windows were specially made for each frame. Even if they look the same, there could be slight variations in size, so you’ll want to make sure you’re replacing each window back in it’s original place. Save yourself the headache later by properly labeling from the beginning. 2. Test for lead! If your home was built before 1978, you probably have lead-based paint somewhere in your home. Exposure to lead paint can cause serious health problems, and calls for special treatment when renovating and restoring your home. Do yourself a favor and pick up a lead test kit at your local home improvement store before you get started. Learn more about lead safety here. 3. Use steam. Anna taught us an easy, safe method for removing paint from wooden windows by using steam. Using steam dampens the wood, making it easier to scrape and also suppresses any lead paint dust that you would encounter if you simply started scraping or sanding. Anna assembled a steam box using foam board insulation and HVAC foil tape. She then cut a small hole and inserted a hose to a steamer. We placed the window into the box, covered it, let it sit for 20 minutes, and the window was ready to be scraped! 4. Cutting/replacing glass. Using the steam method above also made it easier to remove the glass window panes. For the panes that needed replaced, we used this little guy to easily score the glass to the perfect size! Side note--Cutting glass is really fun! I enjoyed the little “zipping” noise you hear as you score the glass. I also got really excited when the glass broke with a perfectly straight line. BEAUTIFUL! 5. Repairing damaged wood. We used Abatron’s wood repair and restoration kit to repair damaged wood to both the window frame and the window sill. Everything you need is included in the kit, you just need to be prepared with a paint brush and some mixing containers. The two-step process will bring new life to wood that has seen better days. 6. Replacing the window panes. Once we removed the glass and all of the old glaze and paint that once surrounded the glass during the steaming process, we got to work with replacing the window panes. We placed fresh glazing compound along the frame and positioned the new glass into place. We then added new glazing points into the window frame to secure the glass (glazing points are small metal fasteners, and can be applied with a tool that looks similar to a staple gun). Once the glass was secure, we added a thick layer glazing compound around the perimeter to seal the edges and ran a wet putty knife to remove the excess glaze to create a nice, smooth line around the edges. And voila! We successfully restored the window and it was ready to re-install. While we may be far from experts, Aaron and I learned a lot of useful tips at the workshop. I’m confident that if we ever find ourselves in need of replacing some old wooden windows, we could do so on our own (maybe with some guidance from our more hands-on preservation friends). Have you ever restored your own windows? How did it go for you? Share your best practices tips in the comments below. Are you interested in attending a workshop similar to this one? Let us know and we can start planning something to bring to the Friendly City!